After our weeklong stay in Knoxville we spent several days camping and sightseeing in Georgia. 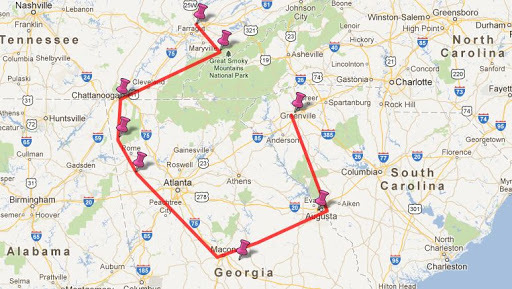 We then circled back northward yesterday to end up in Greenville, South Carolina, where we have again rented a weeklong extended stay. 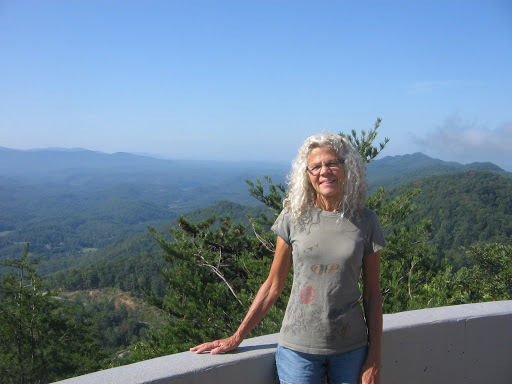 We have been in the Greenville area before but would like to spend more time this visit so that we can take advantage of the nice weather and the proximity to the Blue Ridge Mountains. The last 2 days of our week in Knoxville were spent visiting Great Smoky Mountains National Park. Our first visit was to the area called Cades Cove. Besides the historic farms and cabins that are a popular attraction, this valley also offers some of the best opportunities in the park for viewing wildlife. An 11-mile loop road winds through the valley and we decided to ride our bikes, instead of driving the car. We were surprised at how many cars were on the road, considering it was after Labor Day and not a weekend. At one point, as were pedaling along, up ahead of us we saw a large group of cars that were stopped and people were getting out to look along the roadside. As we approached, we realized the attraction stopping the traffic was a small black bear ambling across the road and through the adjacent meadow. I’ve seen black bears in the wild before but the unique behavior we observed from this guy was that he proceeded to climb up into a nearby tree and skillfully balanced himself on a couple of shaky limbs that didn’t look nearly strong enough to support his weight. But, apparently, he knew what he was doing and seemed to be enjoying his perch oblivious to us gawking tourists below. Near the halfway point of the Cades Cove loop road we made a diversion down a side road that led to the trailhead of a hike to a waterfall on Abrams Creek. It was a five-mile round trip hike to get to the falls and back, but well worth it for the views at the falls and along the trail. There was a bit more climbing up and down of ridges on the trail than what we had expected. Not to mention that the Cades Cove loop road presented some uphill challenges on the bike ride portion of our tour. Needless to say, we were pretty tired after our first day in the Smokies. Our second day in the Smokies was no less exhausting and exhilarating, but for different reasons. We mapped out a circuit hike using a park map and combining portions of trails that looked interesting to us. Once again we had no way to judge how much elevation climb to expect. As we hiked this day it wasn’t just the elevation that was a challenge but there were several stretches of trail that were filled with fallen trees requiring ups, overs, unders, roundabouts, and whatever other means we could devise to negotiate the piles of brushy tangles. It was only at the end of the day when we finally made it back to the car that we stopped to read a notice on a kiosk warning hikers of trail closures due to spring storm damages that had not yet been cleared out. Wouldn’t you know it, several of the trails mentioned were ones that we had been hiking on. But, difficult as it was, it was all part of the fun and adventure. 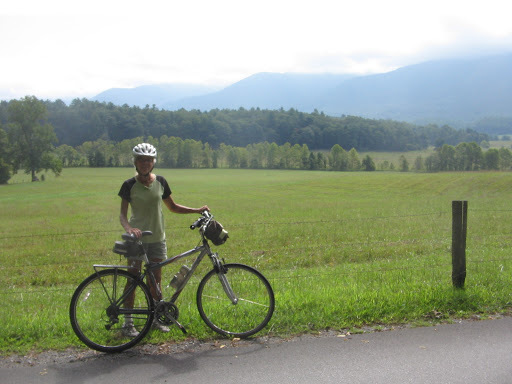 Biking on Cades Cove Loop Trail in Great Smoky Mountains. Abrams Falls hike at Cades Cove. 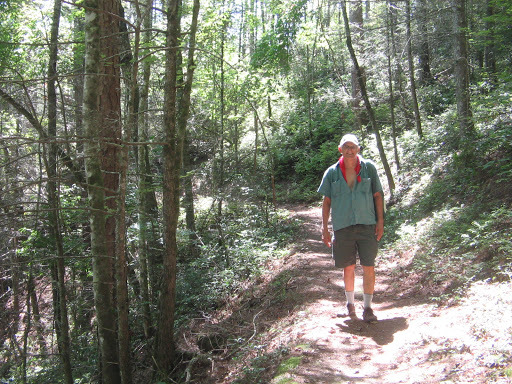 Descending Little Bottoms Trail on hike in Great Smoky Mountains. 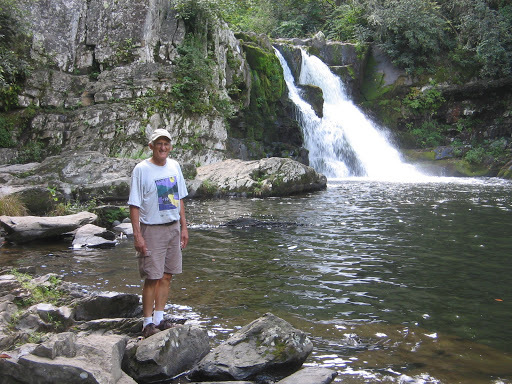 Georgia does not have the mountains like the Smokies and the Blue Ridge that we love to explore, but we were pleasantly surprised at the many opportunities we did find there for enjoying the great outdoors. 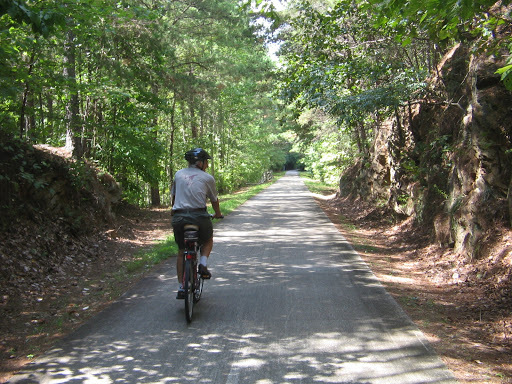 One day we rode our bikes on a portion of the Silver Comet Trail, a 60-mile rail trail that starts in Smyrna, Georgia, passes close to Atlanta and ends in the northwestern part of the state at the Georgia-Alabama border. We did a short out-and-back ride near the center of the trail, starting at the Rockmart trailhead. We were told by a fellow bicyclist at the end of our ride that we had selected the best portion of the trail because it passes through less-populated areas and is more scenic. 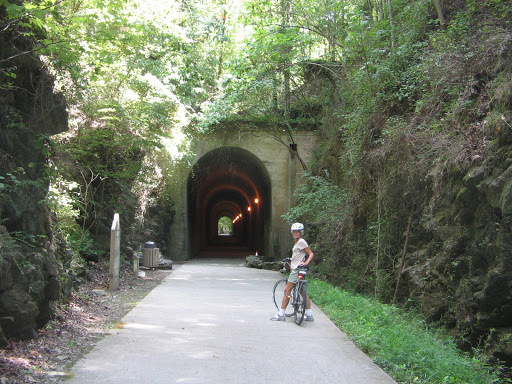 We agreed that it was a scenic ride and even had some elevation that is usually not part of a rail trail ride. Brushy Mountain tunnel on Silver Comet Trail. 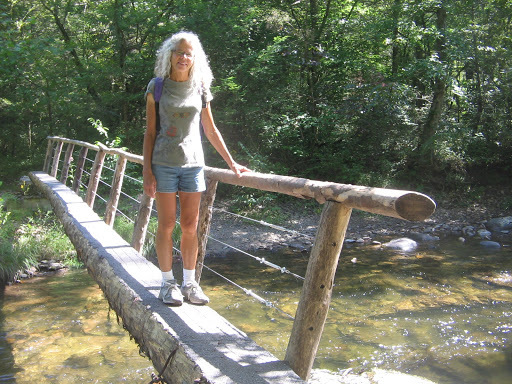 Riding the Silver Comet Trail. Other things that we enjoyed in Georgia were 2 nights at a couple of different state parks. The first was Sloppy Floyd State Park, near Summerville, Georgia. What kind of name is that, you might well ask? 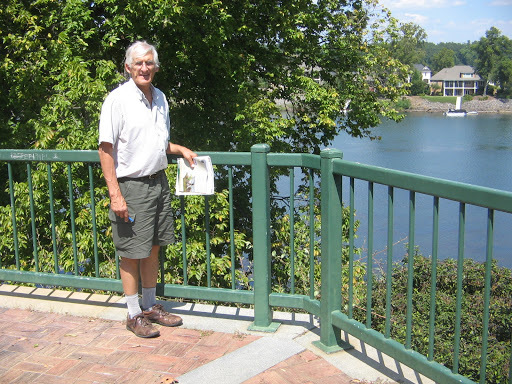 This park was named for James H. (Sloppy) Floyd, who served in the Georgia House of Representatives from 1953 to 1974 and was from the area. 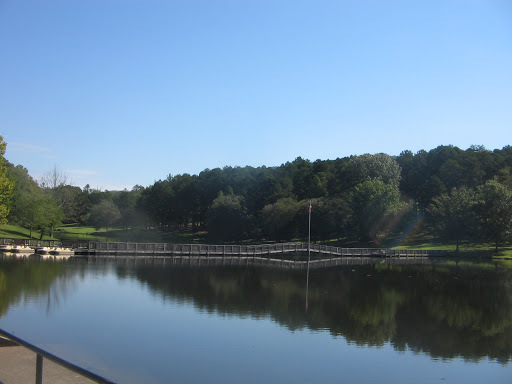 We loved the quiet, beauty of this small park, surrounded by rural countryside and the Chattahoochee National Forest. Sloppy Floyd State Park, Georgia. Another night of camping in Georgia was again at a small rural park, Hamburg State Park, along the edge of quiet Hamburg Lake fed by the Little Ogeechee River. 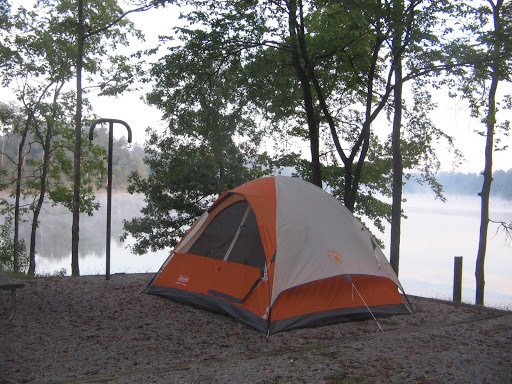 Campsite at Hamburg State Park, Georgia. 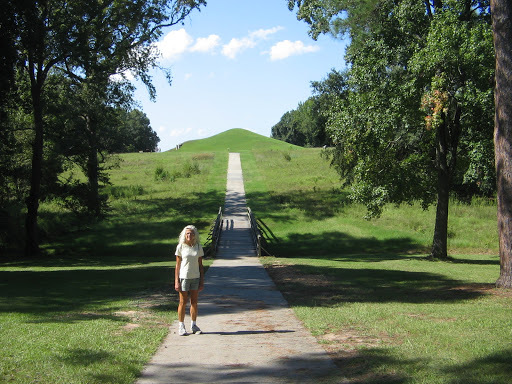 A trip through central Georgia wouldn’t be complete without a stop at Ocmulgee National Monument, a place of interest to students of American Indian history; hence, something on Lee’s bucket list. I enjoyed it, too, because, to see the Indian Mounds that are there, it requires walking outdoors on a circuit path and it was a beautiful day to be outside. Ocmulgee National Monument path to Indian Mounds; Earthlodge (underground ceremonial meeting house) in background. And last, but not least, before leaving Georgia to cross over into South Carolina, we stopped in Augusta, Georgia, visited the downtown area and walked for a bit along the Riverwalk path that parallels the Savannah River. Riverwalk along Savannah River in Augusta, Georgia. South Carolina visible across the river. After last week’s hiking, driving, and bike riding we look forward to being planted in one place again for a full week. The weather promises to be gorgeous September days so we won’t be sitting around indoors for very long here in Greenville. As we study maps and brochures of the area, I’m sure we will find the right balance between rest, relaxation and recreation during our time here.